The chief operating officer of flash array maker Violin Memory has stepped down. Dixon Doll Junior's departure is the latest in a series of events to batter the flash pioneer since it floated on the New York Stock Exchange last September. In a statement, Doll said: “now is an appropriate time to let new leadership chart our future course”. Doll’s severance package included $450,000 and at least $4.1 million in stock. In December 2013, CEO Don Basile left the company and was replaced by Howard A Bain III as the company's interim chariman. Basile led Violin through its initial public offering (IPO), in which the company raised $162 million, selling shares for $9. However, Violin stock fell to $7 on the same day and by the end of November had plummeted to $3. It is thought investors were scared off by how quickly Violin had been using its cash reserves. At the end of November Violin shareholders launched a class action against the company, claiming that crucial information had been withheld prior to the IPO, namely that it had suffered from a dip in sales owing to the US government’s budget cuts. 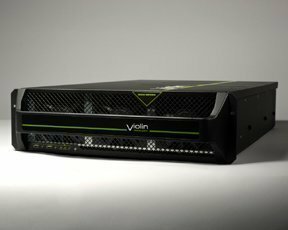 Violin is one of several flash array startups that arose as flash storage rapidly gained ground over the past two or three years. It had been considered something of a pioneer and market leader, but recent events have been something of a setback. The company also lost software CTO Jonathan Goldick in December and marketing vice-president Max Barletta this year. Last year the company lost a strategic partner in HP when that storage giant decided to concentrate on its own 3PAR range of storage arrays. As a result of the recent turmoil, activist investor group Clinton Group has advised the company to seek acquisition. Violin makes all flash arrays populated by proprietary flash modules it calls VIMMs (Violin Intelligent Memory Modules), which are the result of its own software being baked into silicon in a partnership with Toshiba. It rivals players in mainstream storage players such as EMC with its XtremIO all-flash arrays and other startups such as Pure Storage, which looks all set to go for an IPO this year.